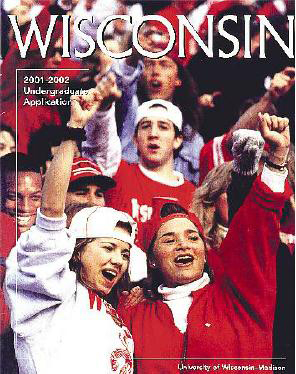 In 2001, the University of Wisconsin-Madison published the admissions brochure above. All seems right, doesn’t it? The photograph shows students having fun at what appears to be a Badgers football game. As it turns out, one of the students wasn’t even there. Diallo Shabazz, the only African-American student visible in the photo, hadn’t attended the game. In fact, his photo had been taken in 1994 and had been hastily added to the photograph (taken in 1993), all in an effort to show the school’s diversity. Before and after images can be seen below. The University’s undergraduate admissions director, Rob Seltzer, said his office spent the summer months looking for pictures that would show the school’s diversity, but had no luck. Universities demonstrating how “diverse” they are is certainly not new. And you might well imagine our own admissions brochure similarly featuring a nice cover photograph of a racially balanced group of students appearing to chat with one another on the mall. 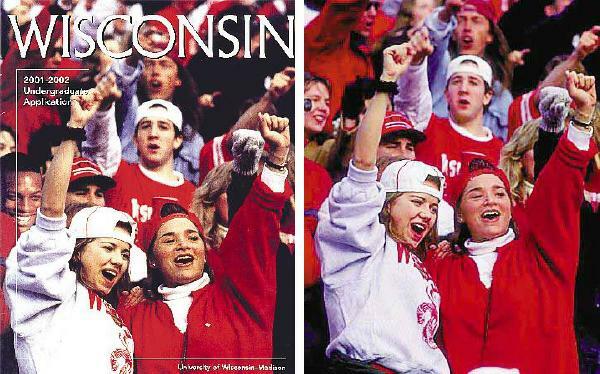 So what’s the difference between this sort of staged photograph and what the University of Wisconsin did? What are the ethics here? ← IS NATIVE ADVERTISING DECEPTIVE JOURNALISM?